Soft and romantic, this tulle and lace wedding dress, with hand-placed lace appliqués is effortlessly elegant. The sweetheart neckline, natural waist, and scalloped hemline emphasize the ultra-feminine sheath silhouette. Finished with covered buttons over zipper closure. 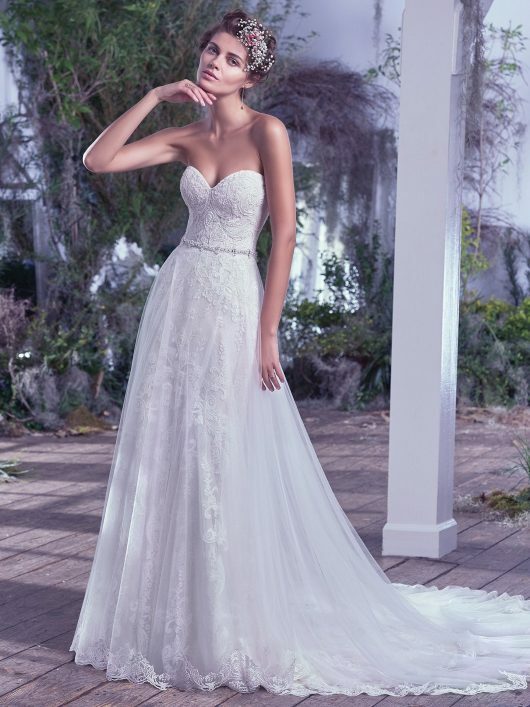 A detachable tulle overskirt is available featuring an exquisite waistline created with Swarovski crystals and pearls and finished with a coordinating lace hem. Detachable tulle and lace overskirt sold separately.